Google has unveiled a new tool that allows users to create a Street View - a 360 degree virtual tour - of any place and share it using Google Maps. These can be created by using photos taken by an Android phone or DSLR (digital single-lens reflex) camera. The tool lets users connect various photos and, once published, people can navigate between them on Google Maps. 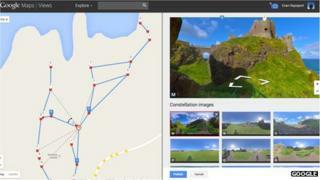 Google said the move will allow it to expand the reach as well as the uses of its maps service. "We are excited to see the different types of Street View experiences that everyone will contribute," the firm said in a blog post. "For example, this feature can now enable environmental non-profits to document and promote the beautiful places they strive to protect. "It also opens up a new tool for photographers to showcase diversity in a specific location - by times of day, weather conditions or cultural events - in a way that Street View currently doesn't cover," it added. Digital maps have become a key growth area in recent times, not least because of the surge in popularity of gadgets such as smartphones and tablet PCs. Google, a big player in the sector, has been aiming to expand its presence further, analysts say. In June this year, it bought an Israeli social mapping company, Waze. As it announced the deal, Google had said it planned to enhance Google Maps with Waze's traffic updates feature. Rival Apple also launched its own map app in 2012. Earlier this year, Apple bought indoor-mapping specialist Wifislam to expand its maps product in an apparent effort to compete with Google. Other geo-location apps, such as FourSquare, Tinder and Here On Biz, are also incorporating mapping services of some kind. Meanwhile, Google has been trying to look at different ways of gathering images for creating its street views. The firm has usually sent out cars and trikes, a three-wheeled vehicle, to gather the images, which made it difficult to capture locations that were less accessible. Earlier this year, it created a modified backpack called Trekker, to enable people to walk to remote locations and get the 360 degree images required. The Trekker has already been used in the Grand Canyon and from the world's tallest building, Burj Khalifa.